Enlisted in the AIF (Austrlian Imperial Force) and served in the 11th Field Artillery Brigade returning to Australia on 13 April 1917. Ernest Albert Griffiths Enlistment and Service record. He joined the Australian Imperial Force on 23/7/15 and served in the 11th field Artillery Brigate until he returned to Australia on 13 April 1917. Gunner Ernest Albert Griffiths, Service No. 4947, 11th field Artillery Brigade. born Launceston, Tasmania Australia, son of Thomas Griffiths , occupation prior to enlistment Brewer, Tamar Brewery, Launceston Tas, Enlisted 23 July 1915 at Claremont, Tasmania, Served in Egypt and France, returned to Australia, 09 June 1917 aboard the Barambah, Died 10 September 1954. [S6] Tasmanian Pioneers, Archives Office of Tasmania, (The Royal Melbourne Institute of Technology in Association with the Archives Office of Tasmania) (Reliability: 2), 7 Oct 1873. [S34] National Archives of Australia (Reliability: 3), 23 Jul 1915. 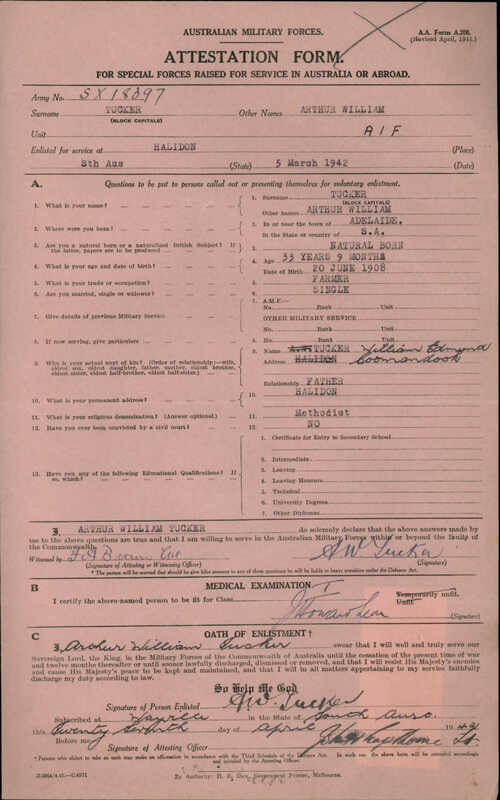 See attached World War 1 Military Service Record. [S98] State Library of Tasmania (Reliability: 2), 10 Sep 1954. In the Supreme Court of Tasmania, be it known that Ernest Albert Griffiths of 21 South St Launceston in Tasmania, War Pension died on the 10th Day of September 1954. [S97] Carr Villa Memorial Park Cemetery (Reliability: 3), 13 Sep 1954. [S10] Tasmanian Federation Index, Registry of Births Deaths and Marriages Tasmania, (Macbeth Genealogical Services Pty Ltd) (Reliability: 2), 11 Feb 1918.